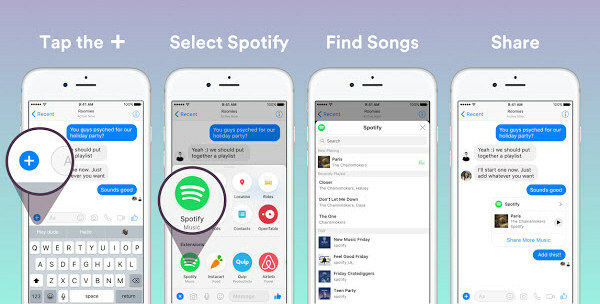 Spotify, as one of the well-known streaming music services, it is not more than just discovering for and listening to music, but also packed with more decent features, including sharing music to others, building playlists with your friends, and listening to music offline. Among which Sharing music with others is a deep seated way to discover new bands, talk over your music tastes. 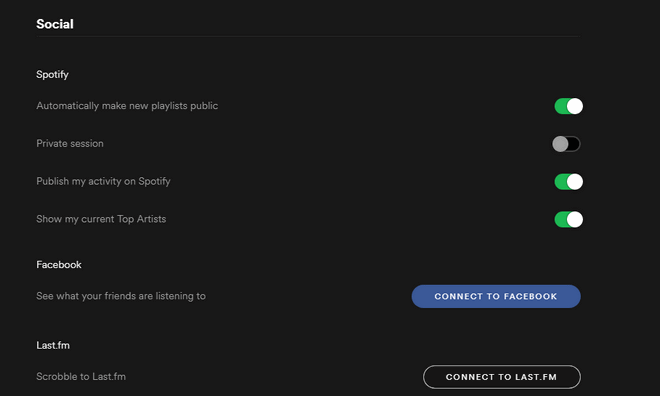 Because Spotify has many useful playlist sharing features, here we will talk about how to fully use these tips to share Spotify playlists to others on different devices including computer, iOS or Android devices, and discover more music via these advanced features. It is very easy to share Spotify playlists to social channels and other messaging services direct from its app. 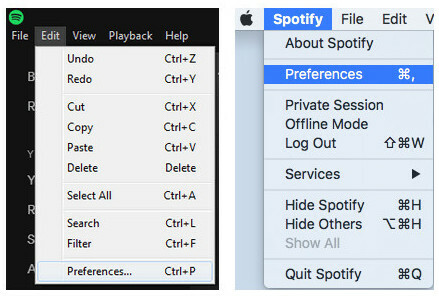 Step 1: Open Spotify music app on your PC or Mac, then search for the music or playlists you want to share. Right-click button, and click Share. Step 2: You can click the channel like Facebook, Twitter etc you’d like to share to, add or edit the message to post. Or you can click COPY LINK TO CLIPBOARD to paste the link, click URI to copy a code that you can use within the Spotify search bar, or copy embed codes with the < /> button. You can also go to Preference center to make your Spotify music public and scrobble to Last.fm in which all of your listening will be tracked and recommended to others through radio. Go to Social part to turn on the selection and connect your Facebook and Last.fm. If you have Android phone or iPhone, you can share your Spotify music to other with QR code. It is versy easy to operate. Step 1: Share a QR Code. Download or update Spotify app to the latest version on your Android phone, then open the app to play the music or go to radio station, tap for more options. The QR code picture will show on the screen above the options like "Save" and "Add to playlist". You can show this screen to other Spotify users to scan it for playback or you can hold the screen to save the QR picture and send it to your friends, so that they can longpress it and recognize the code to play the music you share. Step 2: Scan Spotify QR Codes. Open Spotify app and go to the Search tab and tap camera button. If you haven't yet allowed Spotify access to your camera, please tap SCAN, then ALLOW if you haven't yet allowed Spotify access to your camera. 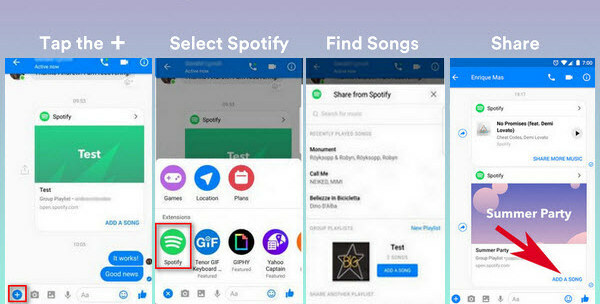 Step 1: Add Spotify extension on Facebook Messenger app.To enable the new extension of Spotify through the link: http://m.me/Spotify. Open the Facebook Messenger app and select the group of people that you want to create a playlist with. You will see a little blue circle with "+" in the left bottom on the chatting interface, just tap it to access the extension. 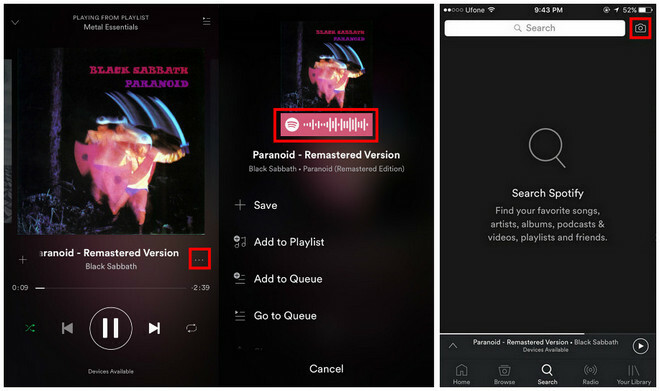 Then you will see some extensions below, and tap Spotify logo to add it. Step 2: Create a playlist. Create a playlist and text the name you like. Then we can send the playlist to group. Step 3: Add music to playlist and share it. 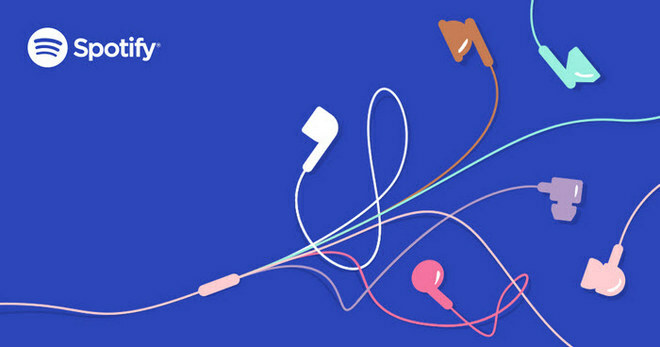 Now, you can begin to add songs from Facebook Messenger. 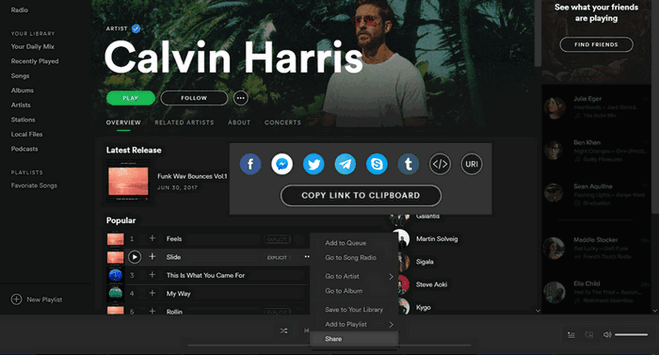 The extension allows you to search for songs and add it to the playlist you create. The tips mentioned above are the effective and usual ways to share and discover music, but on condition that the person you share to has a Spotify account to access it. So today i would like to introduce a way to share Spotify playlists to others who can access it directly without needing to install Spotify app and having a Spotify account. All you need to do is to download Sidify Music Converter for Spotify on your Windows PC to download Spotify music to your PC and share them to others via Email. 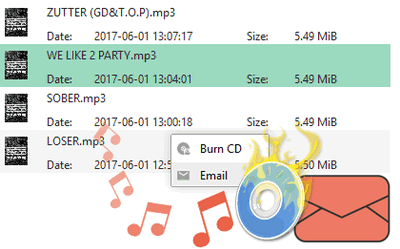 Keep all ID3 tags and metadata to organize music library.